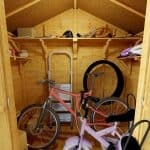 Plenty of room in here for two adult bikes and more. There are a couple of issues, mainly around customization costs that seem more necessary than a luxury, but a strong frame and tongue and groove work save the day. 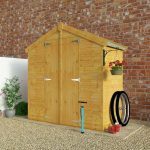 This is a bike storage unit that has been specifically designed to help you manage bikes of all sizes. 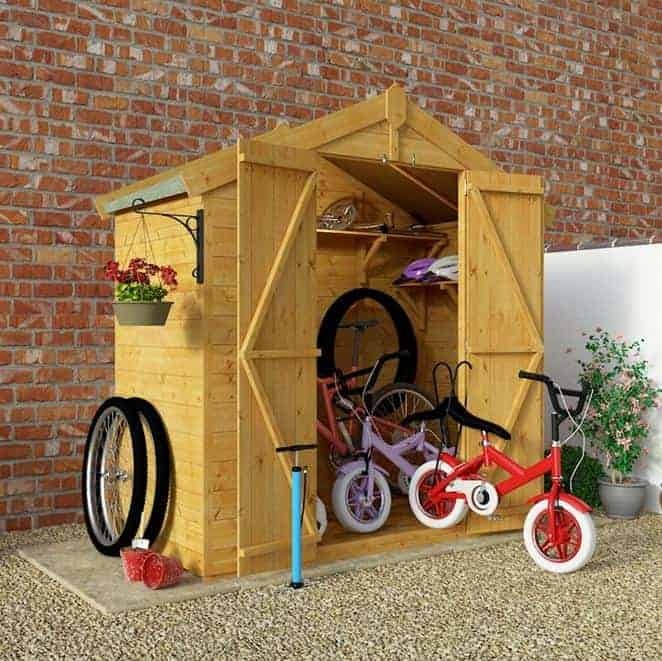 It has an apex roof that helps massively when it comes to water damage, because the water run off is more pronounced and therefore better for the bikes that are to be kept inside. The building has a width of 181.4 cm and this is not reduced internally. The depth doesn’t make a compromise either, starting out externally at 87.9 cm and staying that way inside the building. One of the things we really like about this building is the roof. 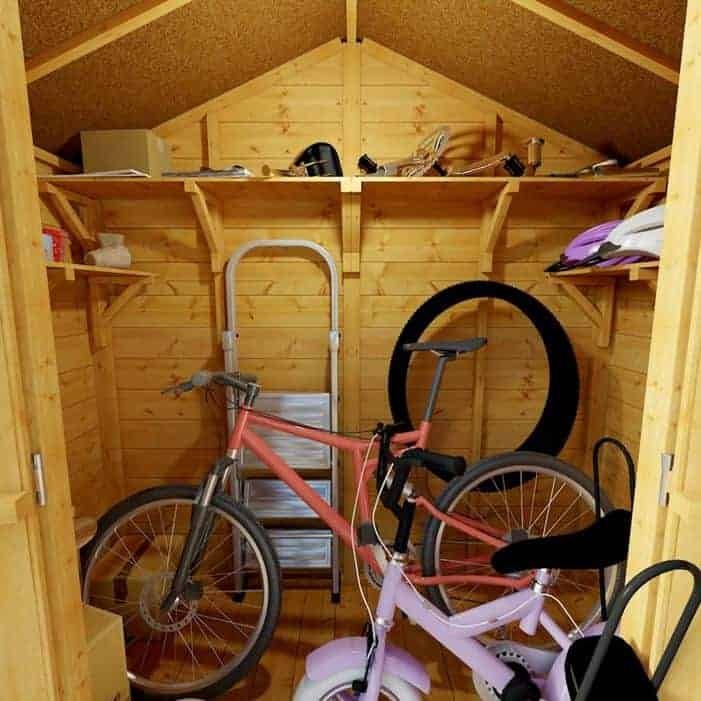 The apex roof really makes a huge difference inside the building, because it simply allows you more options when storing your bikes. 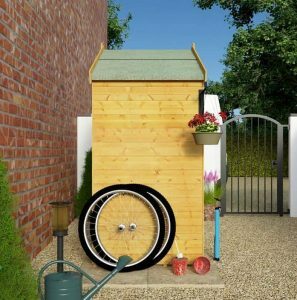 Wheels, for example, can be positioned up towards the roof, allowing for more usage of the space inside. The apex also means that you have more headroom when you are in the building, which is always handy. 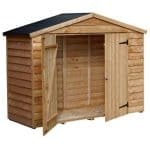 The compromise comes with the roof covering, which is mineral felt. No slouch in the protection stakes, it still could have done with some options. However, we were most impressed with the cladding. We like tongue and groove because it shows us that the building is in it for the long haul. 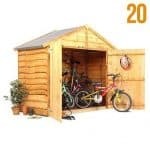 It also means that you have a building that will not let in rainwater, as well as a building that is naturally heavier due to the fact that timber is locked together. 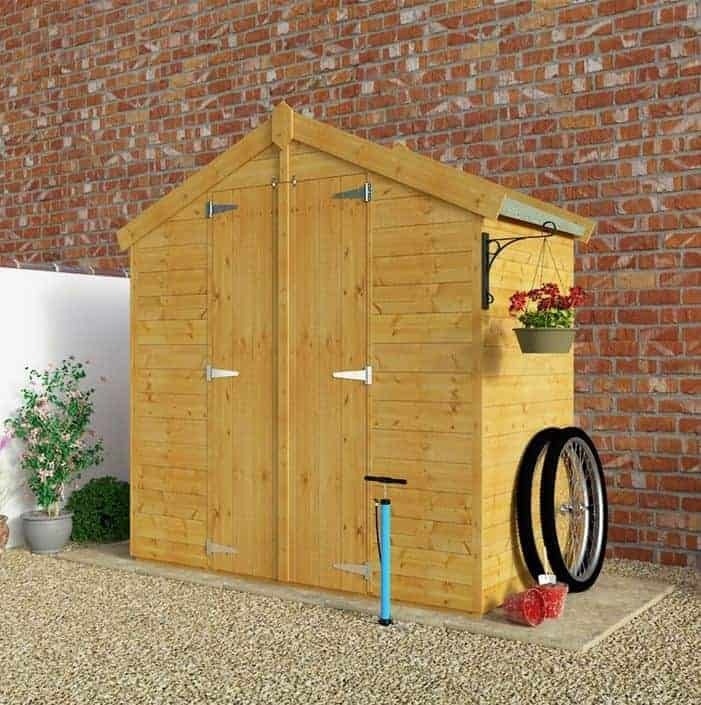 This tongue and groove is a bit of a pleasant surprise considering the unit is so competitively priced, and we were especially pleased to see it included in the cladding. The floor has choices attached to it, which we like. There are the makings of a very strong building here, and having some clear options in the floor makes perfect sense. You can chose between the solid sheet flooring or tongue and groove. The tongue and groove is only £6 more, so we see it as no contest. With tongue and groove in the walls, it makes sense to have it in the floor too. This gives you a very robust building. As if all that tongue and groove wasn’t enough value, you also get a unit that has been pre-treated at the factory. This means more longevity and less hassle for you with all that annual treatment no longer being required. There are no windows due to this being a security shed you use to keep bikes safe. The double doors open up to 82.5 cm and this is absolutely perfect even for larger bikes. In other words, it is a carefully constructed building. There is a simple turn button supplied for security and we were a little puzzled by this. We would have looked into putting a lock on the building, but could not find any fittings spaces. However, the lack of windows does add a little extra security to your usage. You can actually choose the base of the unit as part of the customisation options involved. These are quite interesting, and include just having the bearers or going for the Eze Base option. Both make sense, but if you’re kind of lacking in the technical department we would suggest the Eze base. A mixed bag, erring towards good quality overall. We couldn't ignore the fact that there is tongue and groove and it really does make all the difference to the quality of a building. The apex roof also adds massively to the overall quality and brings you a building that you know will have a good and strong outlook. Tongue and groove almost saves the day. But you have to buy a little extra, like the flooring for example, to get the most longevity. That apex roof works brilliantly to ensure you can store large bikes, and the width of the doors helps. 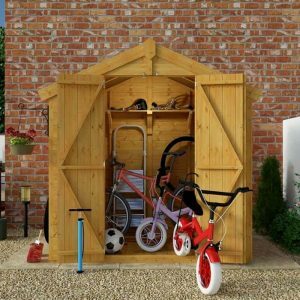 Two adult bikes can easily be stored, alongside children’s bikes. Not the easiest instructions, but you could probably get this up in a day if you had two people. Real value here in the tongue and groove. But little things here and there just add extra cost, which dampens the impact a little. 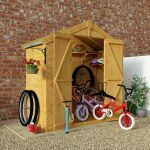 Final Thoughts: A good quality bike storage. We liked it a lot, but we felt that to maximise your enjoyment and utility, you would have to purchase the extras. This is no bad thing but not doing this makes it less than perfect as a building. The apex roof is good and it is very roomy.